Our selection and suggestions become very helping once it involves interior decoration. Maintaining a beautiful interior is on our prime list. Besides, furniture, floor and ceiling, we must always conjointly pay special attention to the walls. Decorating the wall with nice paintings, soothing curtains with lovely wall paint may be a and. Now a days, as individuals are getting a lot of and a lot of beauty awareness, having an outstanding area is additionally changing into essential. to create your area way more elegant Hero electrical is providing its most gorgeous series. If the inside of your area is in lightweight colours and you would like to stay it straightforward and soothing, Floral white is that the best choice for you. Floral white series is very elect for its class and beauty. Moreover, Floral white is for offices and skilled interiors. You can use Floral white series with dark interiors as in distinction with the background and overall look. To decorate your room/space with highlighted sockets/switches, Floral Black is that the most suitable option for you. If the inside furnishing of your area is dark with lightweight painted walls and dark hangings & paintings with our most difficult Floral Black series, nothing is a lot of charming than this. One of the foremost mercantilism series of electrical switches is that the grey Texture Series. This comes within the much loved grey shade, with a really elegant texture. Grey Texture Series is incredibly tight and chic furthermore because it is that the most flourishing series along side being elegant. If the inside of your area is in lightweight colours and you would like to stay it straightforward and soothing. Then Golden texture series is that the best choice for you. Golden texture series is very elect for its class and beauty. Golden texture series is additionally suggested for offices and skilled interiors. This series are often used with dark interiors as in distinction with the background and overall look. This series is generally ordered by the shoppers who want a whole neat and superlative end to their space/room. These product offer the exceptional bit to your walls. Many people like Piano series around the world thanks to its splendid texture. Hero electrical doesn’t compromise on quality of the product. Stylish Series is incredibly maturely handled, throughout choice of the fabric used for producing furthermore as for the choice of its style and color. excluding alternative known electrical series introduced by Her electrical, trendy Series is that the most distinctive among all of them and has perpetually got special attention of the purchasers thanks to its class. Moreover, its appropriate for all interior sorts. The product of fashionable Series are often optimally used with any life vogue whether or not you would like a a lot of skilled or tight surroundings alternatively you want for a typical casual hunt for your area. It conjointly suits with the fashionable bit interior. In short, trendy Series of Hero electrical proves itself to be the most effective selection for all times. As the name indicates, the most plan behind the introduction of this series was to satisfy the strain of sensible individuals with sensible minds. The distinctive kind of sensible Series with the foremost aesthetic combination of grey and white mix is likeable by thousands of our customers. sensible Series is appropriate for each dark and light-weight interiors. Mostly people order it for freshly designed homes,offices and malls/plazas with trendy design. Moreover, the fabric utilized in these switches and switch plates is of out category quality and no alternative electrical business will out beat Hero electrical in quality of the product. Smart Series is specially enticing for those that have a really sturdy vision for contemporary interior decoration ideas. 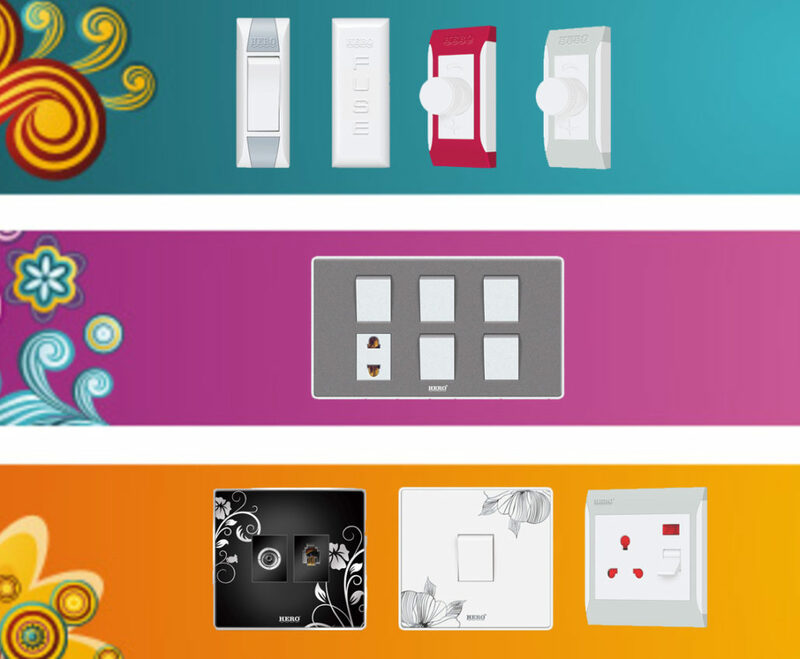 Nice Series of Hero electrical is that the ideal series of switches and electric plates(boards). All the product underneath this class square measure the one in every of their own kind with elegant look to feature soothing result to you life. Nice Series is generally appropriate for the rooms with dark interior decoration and light-weight curtains. If you put in the great Series at your searching malls, plazas and company buildings/offices, it’d offer the marvelous result to the general look and decoration. the sunshine coloured switches and electrical plates with a really tight bit of grey distinction, adds a true soothing result. Moreover, the producing of the product meets the international standards. Installation of Hero electrical product is additionally terribly simple and therefore the product square measure safe to use. One of the foremost mercantilism series of electrical switches is that the Edge Series. This comes in 2 shades, one is grey and therefore the alternative is Red (Edge grey and Edge Red Series respectively). Edge grey is incredibly tight and chic whereas Red is that the most flourishing series along side being elegant. the whole vary of product is obtainable on the web site. For Edge grey, series click here and for Edge Red series, click here. Best Switches 2019 How to differentiate between a good switch and a bad switch?